Pulmonic Stenosis (PS) is one of the most common congenital heart defects in dogs. It typically results from variable degrees of leaflets fusion and therefore the most common form is a valvular stenosis. This is in contrast with what we typically observe at the aortic level, in which the most common form of obstruction is a sub-valvular stenosis, due to the presence of a sub-valvular fibro-muscular ring. Pulmonic Stenosis is clinically characterized by the presence of a left basilar systolic murmur. Jugular venous distention or pulses can be present in severe cases and/or if significant tricuspid regurgitation occurs. Femoral artery pulses are typically unremarkable. 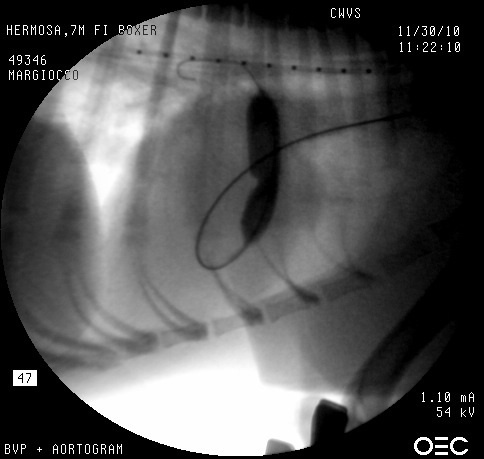 Thoracic radiographs are characterized by a “reverse D” appearance of the cardiac silhouette, and a prominent Pulmonary Artery at approximately 1 O’clock, on DV or VD views. An ECG typically shows the presence of criteria for Right Ventricular enlargement, in the form of deep S waves in lead I, II, III and aVf. Treatment of choice for valvular PS is a minimally invasive procedure called Balloon Valvuloplasty. This is performed under general anesthesia. Access to the circulation is gained through the Jugular Vein. An angiogram is initially performed to accurately measure the diameter of the annulus of the pulmonary valve so that a catheter of the appropriate size can be selected. A balloon catheter consists of a catheter with a non-compliant inflatable balloon that can be used to dilate stenotic structures. Tuesday, November 30th 2010 we performed the first invasive cardiology procedure here at CWVS. Hermosa, a 7 month old female intact Boxer was diagnosed with severe valvular PS and a Ventricular Septal Defect (VSD). A VSD consists of a congenital perforation of the inter-ventricular septum. Ventricular Septal Defects can be classified based on their location and dimensions. Hermosa’s VSD was a peri-membranous (i.e. located close to the membranous portion of the septum, right below the Aortic Valve), restrictive (i.e. small enough to offer appreciable resistance to blood flow) VSD. Hermosa’s VSD was judged to be small enough not to cause significant hemodynamic problems. Pulmonic Stenosis in Boxers has been associated with an anomalous coronary circulation. This has also been observed in the English and French Bulldog, and Bullmastiff. The coronary anomaly described in these dogs is called R2A anomaly and consists of the absence of the origin of the Left Coronary Artery from the left Sinus of Valsalva (at the aortic root level). Instead, the Left Coronary Artery originates from the RIght Coronary Artery and, on its way to the Left Ventricle, encircles the Right Ventricular Outflow Tract, just below the Pulmonary Valve. The presence of an R2A anomaly would represent a contraindication for balloon valvuloplasty, since inflating a balloon at the level of the pulmonary valve could cause damage to the anomalous Left Coronary Artery. Therefore, Hermosa’s valvuloplasty was preceded by an angiogram aiming at outlining her coronary artery anatomy. Under general anesthesia the right Carotid Artery and Jugular Vein were surgically exposed and an introducer of appropriate size was placed in each vessel. An angiogram was performed at the level of the aortic root and the presence of a normal coronary circulation was confirmed. After that, an angiogram was performed at the level of the right ventricle, followed by balloon dilation of the pulmonary valve. The procedure was uneventful and successful. Hermosa recovered from anesthesia and was transferred to the care of the Owner the day after surgery. We will see her back in 8-10 days for suture removal and we will re-evaluate her with an echocardiogram in one month. Balloon valvuloplasty causes variable degrees of swelling of the valve leaflets in the immediate post operative period. It typically takes a few weeks for the valve leaflets to regain their normal mechanical properties. Therefore, we typically wait at least a month prior to rechecking our patients post-valvuloplasty.